CF-5 #116757 arrived at the Museum by road in 1996. 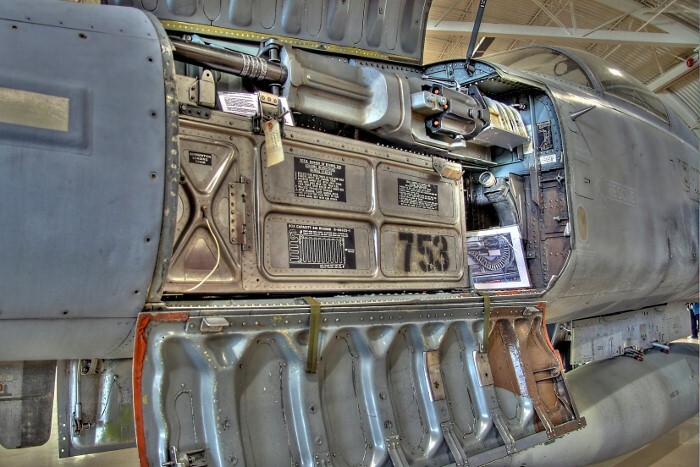 Upon arrival at the Museum, CF-5 #116757 was quickly reassembled. CF-5 #116757 - Pontiac M39 A2 - 20 mm cannon. Northrop Aviation designed the F-5 Freedom Fighter in the mid 1950s to meet an anticipated need for a lightweight, well armed, supersonic fighter that was relatively inexpensive. Initially the USAF was not interested in such an aircraft, but did require a supersonic trainer. 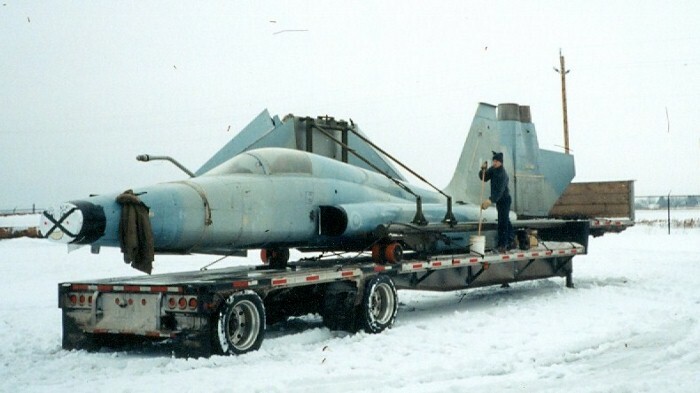 It encouraged continued development of a two seat version, which became the T-38 Talon trainer. In May 1958, the US Defense Department reconsidered its position and ordered three prototypes for its Military Assistance Program (MAP). The first prototype flew in July 1959 and exceeded Mach 1 during its first flight. 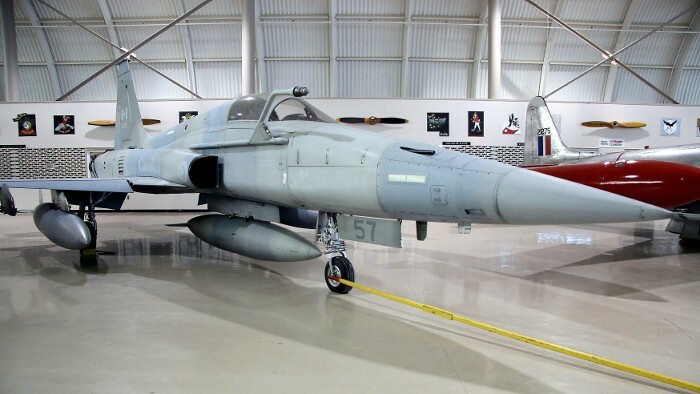 After another three years of development, the F-5 was selected by the Defense Deptartment for the MAP in 1962. In 1965 the RCAF decided to replace its home based North American Sabres with a new aircraft. 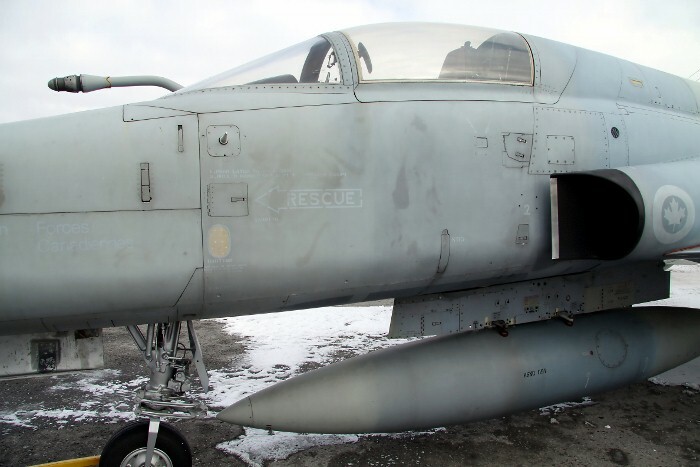 The F-5 was chosen and Canadair was selected to manufacture it, with Orenda Ltd. of Toronto building its General Electric J85(GE)-15 turbojet engines. 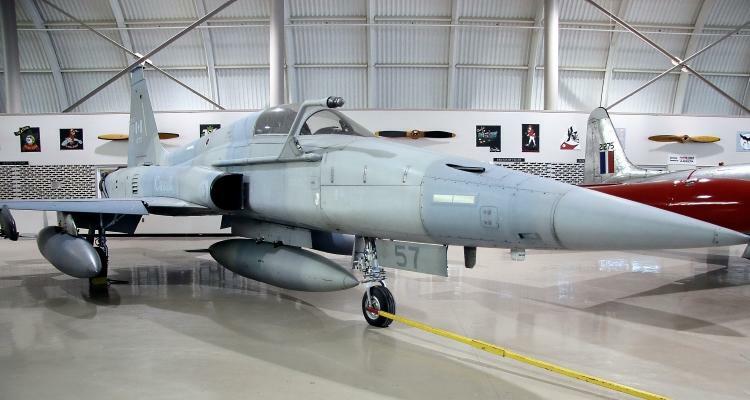 A total of 89 CF-5A fighters and 46 CF-5D trainers were purchased by the Canadian Armed Forces. Production of the CF-5A started in Montreal in 1967 and the first aircraft flew from Edwards AFB, California in May 1968. The first CAF unit to receive aircraft was AETE (Uplands), when both fighter and trainer versions were delivered for testing at the end of 1968. No. 434 “Bluenose” Squadron at CFB Cold Lake, Alberta was equipped with CF-5s soon after in 1969. No. 433 “Porcupine” Squadron, reactivated in September 1969 at CFB Bagotville, was the other squadron to receive CF-5s that year. Later on, both No. 1 FTS (Cold Lake) and No. 419 “Moose” Squadron flew CF-5s in both trainer and tactical fighter roles. The CF-5A continued in service as a tactical fighter until 1988, when the CF-18 Hornet replaced it. The CAF continued to use CF-5Ds as advanced trainers until 1995. 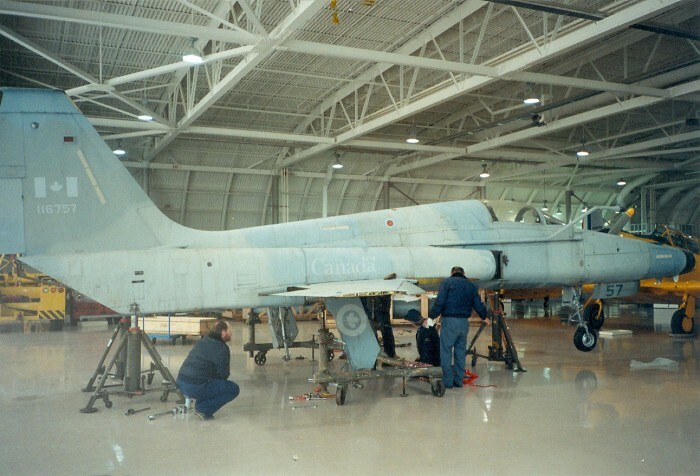 A total of 2,350 F-5 Freedom Fighters were produced, between 1962 and 1975; 240 of them by Canadair in Montreal (135 for the CAF and 105 for the Royal Netherlands Air Force). The Museum's CF-5A was built by Canadair in Montreal in 1970. 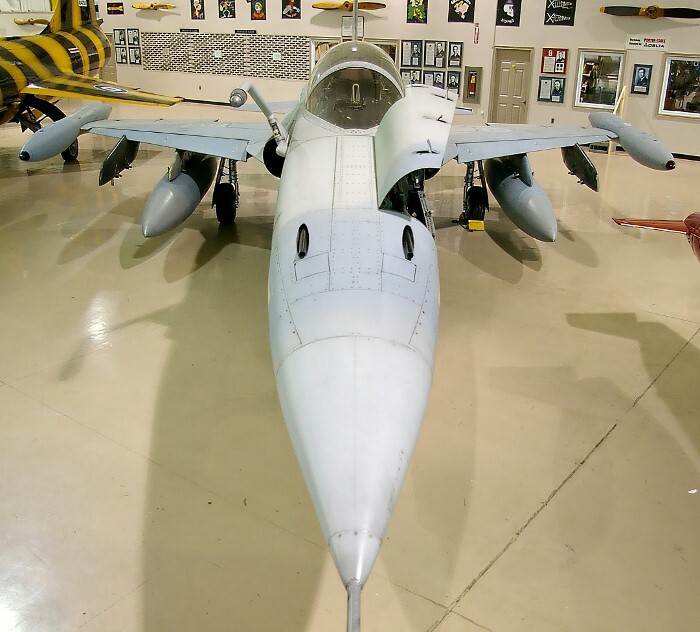 After it was retired from the Canadian Forces in 1989, it was moved to the RCAF Memorial Museum in Trenton, Ontario. Canadian Warplane Heritage Museum acquired the aircraft from the Department of National Defence in 1996.